With the clearly declining market in Film, Fuji’s traditional stronghold, and the recently declining numbers in camera sales (Mostly due to Smart-Phones), questions are being asked about the financial model that would support continued development of niche products such as the Fuji X-Series. Given the concerns, I brought this matter up directly with the Fuji staff at CES yesterday. In response, they took me behind the X-Series demo area, to the 2nd half of the stand, where Fuji’s print technology was on display. The philosophy is simple – we’re happy that people are taking more images, because more image taking drives more requests for some form of ‘printed’ output. And in this market, Fuji have very significant market penetration. As high as 70% in the US market for example. This is not end user printing, this is B2B printing – providing the equipment and print materials to companies, to allow then to provide you the prints, mugs, photo books, posters etc etc you order. This is a huge market for Fuji, with a lot of recurring revenue from materials, as well as ‘start-up’ revenue from equipment such as mini-lab booths, and event photo booths. The booths would be in stores like Walgreens, Walmart etc, the event set-up is a mobile wireless printing lab in a flight case, which wheels into a location, pops up with some local power, connects to a wifi camera like the X-E2, and allows pro printing in real-time, on site. As well as the traditional Fuji print paper, Fuji also provide alternative print materials such as canvas, flex, and metal – all of which are seeing significant growth in sales, as people look for quality output of their images for display in the home/business. Many of the online print services that have popped up use Fuji products and services at the back end, to meet their customer’s requirements – so you upload your image to a website for your custom iPhone cover, and it’s a Fuji product that gets delivered to your door. 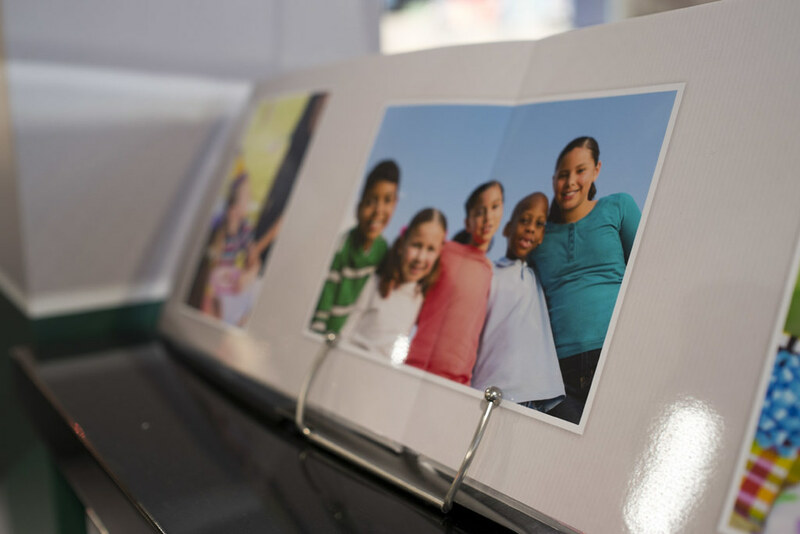 The same story is repeated for photo books – where Fuji demonstrated a high quality ‘silver halide’ product, being provided B2B, to allow online and store retailers to provide customers with a beautiful finished product. 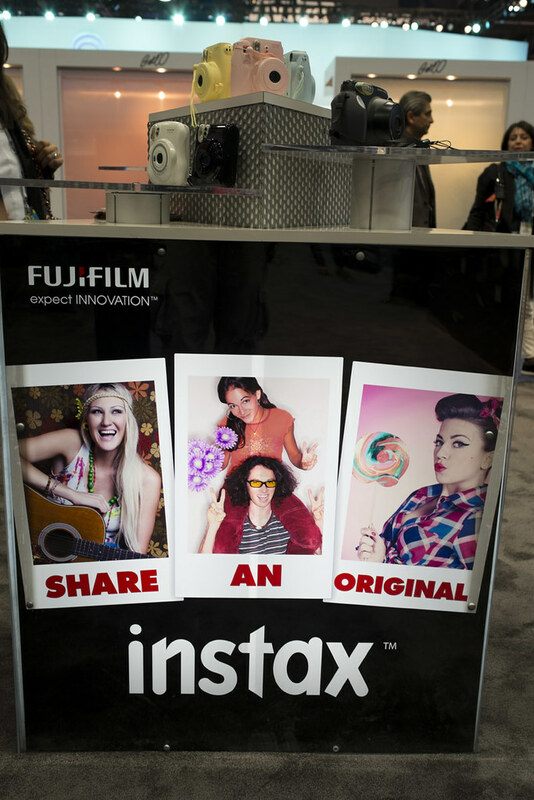 Outside of B2B printing, there was also a large section of the Fuji stand devoted to personal printing, using the ‘instant’ instax system. instax has traditionally been fun ‘party’ cameras, which sell in huge numbers and are still seeing triple digit sales growth year on year. The instax range has now been supplemented by a stand-alone wireless printer – allowing home users to print direct from their smartphones to an instax mini print. The instax ‘Share’ can run off of rechargeable Lithium batteries, or shore-power, and takes the standard 10 print instax cartridge – producing a print for approx 70c. Price is yet to be finalized, but it’s looking like a $199 price tag based on what I saw yesterday – maybe less with promotions or offers. 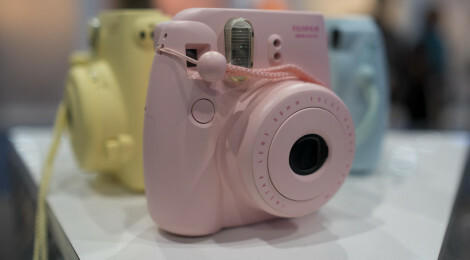 The instax offering created a huge buzz at the show, and Fuji expect the printer to be a big worldwide seller – which of course drives both product and materials sales with good recurring revenue. Fuji are bridging the gap to the smart-phone generation, and giving them the ability to get their images into the real world, and share a physical print. All of these print technologies and products drive revenue back into the company, regardless of whose camera or phone was used to take the shot – more images, more prints, more revenue. You can see how funding X-Series becomes a much more viable proposition, when the whole lifecycle of pictures is taken into consideration.